Before Mariam was born, her parents came to CNEWA, looking for help. The mother was older, and it was clear she needed a Caesarean delivery. The CNEWA staff directed the family to the Italian Hospital, supported by CNEWA in Amman, and helped pay for the surgery. The delivery went well, but the doctors discovered that Mariam has a small hole in her heart. She is being treated with drugs and, in time, it is hoped the hole will close and Mariam will have a long life. This is her second visit to our CNEWA office. Mariam and her father stopped by for the distribution of the Christmas food tickets for Iraqi families. She is healthy and gorgeous. We’re delighted to share that news with our readers — and grateful, as always, for the generosity of our CNEWA family that continues to make stories like this one possible. A nun and patients pray during Mass in the St. Louis Hospital chapel in Jerusalem. Read about how this place has become An Oasis of Compassion in the September 2012 edition of ONE. Among the skills children learn at the Assisi School is how to create jewelry with beads. Kaleketty is a remote forest village in the diocese of Kanjirappally in Kerala. CNEWA stretched its hands to help 50 visually impaired children at a school for the blind run by the Congregation of Assisi Sisters of Mary Immaculate. To help these children develop skills, the sisters conduct academic classes, and also give them training in music, dance, and physical education. They are also trained in rehab programs—making umbrellas, working with rattan and bamboo, or creating jewelry with beads. CNEWA’s support bought musical instruments, along with mosquito nets, mats, mattresses, medicine and day-to-day living items. The Assisi Sisters of Mary immaculate (ASMI) which is a Franciscan Congregation of the Syro-Malabar Church, was established in 1949. The congregation was founded to radiate God’s compassionate love to the most rejected of the society — including leprosy patients, the blind, and the mentally handicapped. The Assisi School for the Blind is a residential school. They have 50 blind children this year studying in 10 grades. Up to grade 7, the students are taught in state syllabus with the help of Braille books. For higher secondary studies, the students stay in the school’s hostel and go to another nearby facility. Proper training, knowledge and encouragement enable them to overcome their disabilities and exceed in life. We sincerely thank our generous donors for supporting this project. You have not seen these young people, and they cannot see you, but they do visualize you with their hearts. Be assured, they pray for you! Today is #GivingTuesday, a worldwide event now in its seventh year, created to encourage charitable donations during the holiday season. Coming after the rush of Thanksgiving, Black Friday, and Cyber Monday, today offers a chance for all of us to care for our brothers and sisters in some of the world’s most troubled places. Will you share this season’s peace, hope and joy with those that might otherwise have none? You can donate here. Meanwhile, check out our #GivingTuesday video above, created by our interns from Regis High School here in New York City. Please share it with anyone who might want to know more about how to help! 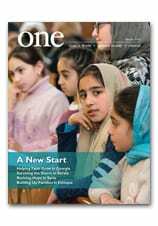 If you aren’t able to give, we still hope you will connect with CNEWA by sharing this video on Facebook or Twitter, or by gifting someone with a subscription of our award-winning magazine, ONE.